MISSION, KS--(Marketwired - Dec 30, 2014) - (Family Features) With so much time spent in the bathroom, it is important to give that space a little TLC like the rest of the home. Almost everyone that enters your home sees your bathroom. From changing accessories to a total bath remodel, it is important that it receives a little refreshment. A bathroom should be an oasis, and the environment that it displays directly correlates with just how relaxing it is. Whether it's coming home from a long day at work to a nice hot bubble bath or spending your morning getting ready and preparing for the day ahead, a bathroom is a place for a little peace and quiet. It is a retreat from the outside world, even if only for a moment. The environment desired should reflect individual style while still providing a calming presence. Wellborn Cabinet, Inc.'s Elegant Bath Collection provides the perfect selection of bathroom vanities and furniture pieces for everyone's personal style in a variety of materials and finishes. Wellborn Cabinet, Inc. has a numerous amount of storage solutions for bathrooms that maximize space including the U-shaped drawer. Being shaped in a "U" is perfect for storage under the sink. This unique design takes into account the plumbing that is found taking up space and provides the opportunity to use the storage in the back. With a simple pull, all items become accessible. 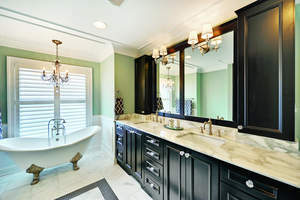 Bathrooms range in all kinds of sizes; however, it is important to know that no matter how large or small, a bathroom can incorporate relaxation and function. Storage is key in a bathroom for stowing towels, personal accessories and other items. Instead of looking at a small bathroom as lacking storage, get creative and try finding space in places you never before thought about. Get inspired. Find that special something that becomes the inspiration for the entire bathroom. For example, maybe it's a tile or even a framed picture.